a theory designed to explain the path followed in moving toward an equilibrium situation when there are lags in the adjustment of either SUPPLY or DEMAND to changes in prices. COMPARATIVE STATIC EQUILIBRIUM ANALYSIS predicts the effect of demand or supply changes by comparing the original equilibrium price and quantity with the new equilibrium that results. 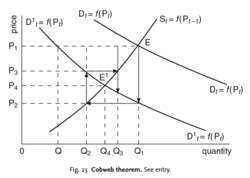 The cobweb theorem focuses upon the dynamic process of adjustment in markets by tracing the path of adjustment of prices and output in moving from one equilibrium situation toward another (see DYNAMIC ANALYSIS). The cobweb theorem is generally used to describe oscillations in prices in agricultural markets where the delay between, for example, planting and harvesting means that supply reacts to prices with a time lag. The simplest case where current quantity demanded responds to current price while current quantity supplied depends upon price in the previous period is depicted in Fig. 23. In the figure, Dt denotes quantity demanded in the current period, St, denotes quantity supplied, while price is denoted by Pt, and price in the previous period is denoted by Pt-1. If demand were to fall rapidly, such that the demand curve shifted left from Dt to D1t, then comparative static analysis suggests that the market will eventually move from equilibrium point E (with price OP1 and quantity OQ1) to equilibrium point E1 (with price OP4 and quantity OQ4). Dynamic analysis suggest that the path followed will be less direct than this. Starting from the original equilibrium price OP 1, which has prevailed in years t - 1 and t , farmers will have planned to produce quantity OQ1. However, after the contraction in demand in year t , supply will exceed demand by QQ1, and in order to sell all the quantity OQ1 coming on to the market, price has to fall to OP2. The lower price OP2, which prevails in year t , will discourage farmers from producing and they will reduce acreage devoted to this crop so that in the next year t + 1 a much smaller quantity OQ2 is supplied. In year t + 1, and at price OP2, demand now exceeds supply by the amount Q1 Q2, and in order to ration the limited supply OQ2 that is available, price will rise to OP3. This higher price in year t + 1 will encourage farmers to increase their acreage planted so that in the following year t + 2, a larger quantity OQ3 will be supplied, which means that in year t + 2 supply exceeds demand and price will fall below OP3, which will discourage planting for the following year, and so on. The eventual result of this process of adjustment is that a new equilibrium is achieved at E1 but only after a series of fluctuating prices in intermediate periods are experienced. See AGRICULTURAL POLICY. Cobweb theorem is very popular in case of market prices; it means that a price of one commodity is much high in this year and much low in the next year and vice versa. Ezekiel, Mordecai, "The Cobweb Theorem," Quarterly Journal of Economics, 52, 1938, 255-280. Do government subsidies stabilize or destabilize agricultural markets?